Putrid Pundits: Spineless Dems Listen Up! 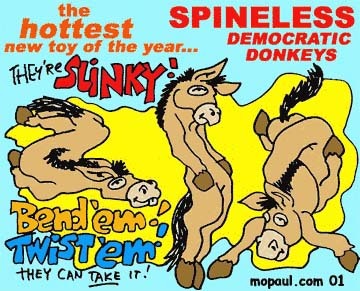 Wake up Spineless Senate Democrats! At this moment the Republicans are right where you want them to be. For the next week (please don't make it more than a week) you will have the opportunity to discuss and debate (though really you'll just be clearing the procedural hurdles thrown in front of you by the Republicans) the reconciliation "fix" that the House has just sent your way. You should be able to get more than the 51 votes required, and if you can't do it easily, SHAME them. Explain clearly to the American people that a vote against the fix is a vote FOR the original Senate bill with the Gator Aid, the Louisiana Purchase and the Cornhusker Kickback. Get out there on CNN, on MSNBC, and yes, even FoxNews and tell the American people that if the Senate fails to act now, the original Senate bill remains the law of the land with all of that wasteful corrupt money. That a vote against the reconciliation fix, or attempts to filibuster are really votes for special deals and siphoned money. If you explain this to the American people, and remember to speak slowly and pronounce each syllable clearly, you might get more than 51 votes. You might even get more than 60 votes. Hell, if you really get the message out, you might get some real bi-partisan action on the "fix".